What comes to mind when you hear the word fungus? Black spots on the leaves of your prized roses? Fuzzy mold growing on bread? Slimy mildew growing on the shower curtain? Or maybe you think of the “yum:” Portobello burgers, sautéed lobster mushrooms. The fungus “kingdom” includes an astonishing array of organisms. There are about 10,000 species of known fungi just in North America, and scientists agree that there are certainly many more waiting to be discovered. Some believe that there are more than 2 million species across the globe! One of the most fascinating group of fungi — and most important to gardeners — are the root fungi, also known as mycorrhizae (my-co-RISE-ee, a term derived from the Greek words for fungus and root). Many species never show themselves above the soil surface, yet they are incredibly important to the soil ecosystem and the plant life it supports. These fascinating fungi even helped plants make the move from water to land! Mycorrhizal fungi form a symbiotic, mutually beneficial relationship with plant roots. These fungi are classified into a number of groups, based on their growth habits and behavior. Some species, for example, are associated with a particular plant type, while others can colonize a wide range of plant species. About 95% of the plants scientists have examined exhibit some form relationship with mycorrhizal fungi. That includes many crop species, including those grown in school and home gardens! In general, mycorrizal fungi attach to and penetrate plant roots, where they have access to the sugars the plants make through photosynthesis — sugars that the fungi need to fuel their metabolic activities. The mycorrizal fungi then form a web of fine, tubular filaments called hyphae that reach far into the surrounding soil — much farther than the plants’ roots. The hyphae act like extensions of the roots, greatly increasing the surface area available for the absorption of nutrients and water. The hyphae filiaments form an extensive yet delicate, lace-like web throughout the soil. This network is called the mycelium. Secrete enzymes that help break complex molecules into simpler forms, releasing nutrients that would otherwise be unavailable for uptake by plants. Help increase a plant’s tolerance to environmental stresses, such as drought and temperature extremes. Appear to aid in plants’ resistance to diseases, especially those caused by soil-borne pathogens. For all their importance and the benefits they confer, mycorrhizae are fragile and easily damaged. Horticultural chemicals can kill them outright. And mechanical disruption, such as from tilling, tears up their delicate, lacy underground web, severing the ties to the plants for which they provide so many benefits. 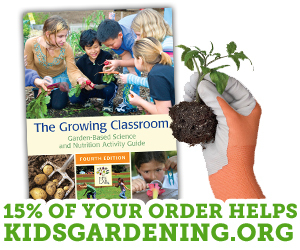 Digging into Soil: A Garden Practicum, is a high school soil science curriculum and activity guide written by KidsGardening in cooperation with The Lower Sugar River Watershed Association to help educators use a garden program to teach students about soil. The target audience is grades 9 -12 and the activities are linked to high school level Next Generation Science Standards. The lessons can be adapted for middle school ages too.